I am cheating a bit, though. I am too lazy tired to get up off the sofa to go upstairs and grab a real book, so I fired up the Kindle app on my iPad, executed a fast finger swipe in the library, and opened the book that rolled to a stop at the top of the screen. The book, An Orkney Maid by Amelia Edith Huddleston Barr, begins with an introduction, so I dutifully counted ten words into that and landed on, ironically, reading. A Google Image search resulted in the above photo, supposedly from http://www.schoolimprovement.com, although I could not find it on the site for proper attribution. 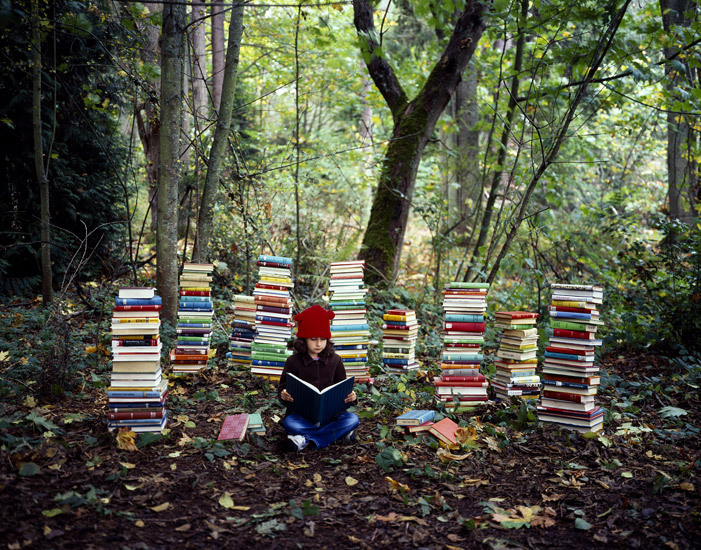 Of the thousands of images that popped up, this one spoke to me because that could literally be me sitting there surrounded by all those unread books. These days, I feel that about the only way I’ll get to read all the books I’ve amassed is to camp out by myself in the middle of the woods. Over the past five years, each time I visited the States from overseas, I collected an assortment of hand-me-down books from my mom and haunted Costco in search of every new Nicholas Sparks (don’t judge) title to add to my collection. I read exactly none of them. I was going to read lots and lots on the crossing from the UK to the US. I loaded more than a dozen new books on my Kindle, just in case the two dozen unread books already on there weren’t enough. I read exactly none of them. A local library had a clear-its-archives book sale two weeks ago. For $10, I was allowed to stuff a cloth eco shopping bag with books. I took them at their word, and waddled out of there with twenty-two books threatening to spill out the top of my bag. I have read exactly none of them. I signed up with BookSneeze, which gives bloggers free books in exchange for posting an honest review within 90 days. I received my first book August 26. You guessed it. I have read exactly none of it. We won’t even discuss the five boxes of books I’ve unpacked in the past week and a half. Ninety percent of them I have not read. Anyone have an unused acre or two of woodland I could borrow? Yes, I do…and I did the Book Sneeze thing one time. Sigh. Totally understand. I started my BookSneeze book tonight…no woods required! Yay!